The Day 2: Amazon India Fashion Week Spring/Summer 2017 for me had a mix of good and not so great outfits. While some I could totally identify wearing, or see being worn during summers…others were a complete miss for me. I am sharing some of my favorites here in this post. My favorite outfit from the collection. I love love how it looks simple from the top and then goes complete glamorous at the bottom. Khadi with metallic gold and silver. Who could have thought about such geniusness. I absolutely loved how the designer duo managed to bring style to this otherwise very traditional sober silhouette. Her collection was dominated by linen sarees in summer cool tones. They looked so so comfortable to wear, and isn’t that the point in summer dressing? I loved the versatility of her collection, giving the ethnic saree a modern twist. One could see pocketed sarees, and multiple choices of fusion saree wear. I am loving her collection. The more and more I see it, the more I can’t figure out which one is my favorite. They all are so summer adorable. Like so wearable yet so chic. I especially love the airy maxis in red. Bold color, flowy…what more do you need for summer. Very feminine very summer…I loved the color, fabric and the sheer flow of the outfit. Haha, I loved the name. So creative and so was the collection. Fun, playful with loads of bold color…the collection was definitely a summer hit. 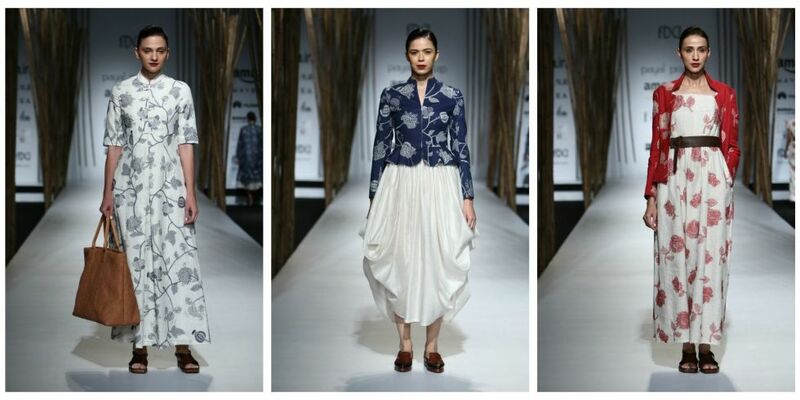 The collection consisted of layered dresses, capes, Ikat woven frock dresses, pants and off shoulder gathered tops. The entire collection was done by a traditional dyeing process called Aal, which is used in Odisha. So I missed this in the Day 1: Amazon India Fashion Week Spring/Summer 2017 post. this actually happened to be the closing show on Day 1. But nevermind, I saw some adorable summer outfits and wanted to share it with you guys. Which ones your favorite?